When thinking of iconic movements that made the history, the savvy collector will logically mention the Omega manual winding caliber 33.3 CHRO. 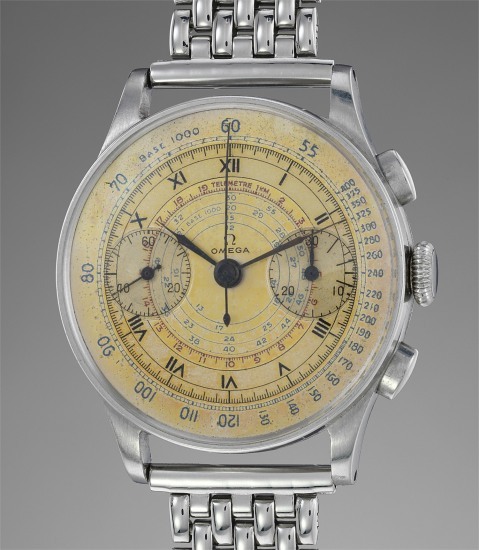 Launched in 1933, the first model using this caliber had only one apparent chronograph pusher while the second one was merged into the crown. In the late 1930s, Omega redesigned it to power some of their finest two pusher chronographs. The present lot is fitted with a very attractive multiple scales dial. Apart from its iconic movement, the charisma of this extremely appealing watch lays in the patina displayed on the dial. With the effect of passing years, the watch face has turned to a warm almost yellow gold color. Some age spots, evenly spread on the surface further adorn the dial like stars in the sky. A strong case with sharp lugs and olive pushers secures this testimony of time like a frame protect a painting.